As i am looking to do it right first time , eg money,time .like to get it right . From what i have read on internet so far ,some people have spent years on layouts . First question....no idea. The general rule on the big-boy railroads, in N. America, is that the 'standard' grade is 2.2%. There are many steeper, but they are not necessarily what is called the 'ruling grade' in any one district. The ruling grade is the steepest grade a single standard freight engine can manage with the typical trailing tonnage assigned to it....by itself, no helper engines. If there is a steeper grade nearby, that would require either lighter trailing tonnage or more help. But for your railroad, you must establish that for yourself. Are you willing, able to assign helpers? If not, what will a single engine manage...how much on what grade. You need, in other words, to do trials on temporarily set up grades. Second question...same response, no idea. What will your engine(s) handle in the way of tight radii? As a general rule, go as wide as you can, but you are not advised to run curves close to the edge of your layout. Derailed cars or engines can tumble. It's okay if they roll and stop, but hardly okay if they also fall 1.2 meters to the floor. If you figure your bench is not wide enough to get the curves you want, fine, widen the bench. But now you invite problems of access, or reach. How will you reach so deep into a layout to retrieve an engine that has derailed? Maybe your layout should be designed as a series of 20" deep shelves that run around two or three walls. You won't get your loop that way, but reach will never be a problem. 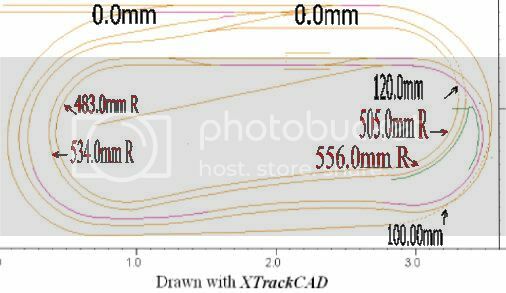 If a loop it must be, and your space is strictly constrained, then your maximum radius is about 2" less than the outside measurement of your layout bench. Always leave about two full inches of 'catchment' in case of tumbling items that cost more than a few dollars. Some people are more meticulous, call it fussy, than others. I am not fussy and am a hurried layout builder. My photos across the web will bear witness to that unfortunate side of me. For many, it is the journey, and not the destination that drives them to satisfaction. Sure, they'll take years to do up a layout really well. I put them together quickly so that I can achieve my real goal, and that is to get to running trains. Most of us are between those two extremes. Last point, and then I must stop...this is always going to be a process of self-discovery in addition to learning about model trains. Look at your first effort as more of a learning experience, and expect to have to dismantle it ere long and try another. It is what most of us do...maybe three months later, maybe three years later, maybe due to a move to another town. You best ally right now is your current orientation to this process....taking it slowly, being open to suggestions, being cautious, and then determining for yourself your way ahead.